Arcos Dorados Holdings (NYS: ARCO) reported earnings on March 8. Here are the numbers you need to know. For the quarter ended Dec. 31 (Q4), Arcos Dorados Holdings missed slightly on revenues and beat expectations on earnings per share. Compared to the prior-year quarter, revenue grew. Non-GAAP earnings per share contracted. GAAP earnings per share dropped. Arcos Dorados Holdings reported revenue of $1.01 billion. The five analysts polled by S&P Capital IQ expected revenue of $1.03 billion on the same basis. GAAP reported sales were 5.3% higher than the prior-year quarter's $958.5 million. EPS came in at $0.23. The four earnings estimates compiled by S&P Capital IQ anticipated $0.21 per share. Non-GAAP EPS of $0.23 for Q4 were 4.2% lower than the prior-year quarter's $0.24 per share. GAAP EPS of $0.21 for Q4 were 4.5% lower than the prior-year quarter's $0.22 per share. Next quarter's average estimate for revenue is $971.1 million. On the bottom line, the average EPS estimate is $0.13. Next year's average estimate for revenue is $4.22 billion. The average EPS estimate is $0.66. The stock has a five-star rating (out of five) at Motley Fool CAPS, with 616 members out of 631 rating the stock outperform, and 15 members rating it underperform. Among 159 CAPS All-Star picks (recommendations by the highest-ranked CAPS members), 156 give Arcos Dorados Holdings a green thumbs-up, and three give it a red thumbs-down. Of Wall Street recommendations tracked by S&P Capital IQ, the average opinion on Arcos Dorados Holdings is hold, with an average price target of $15.75. 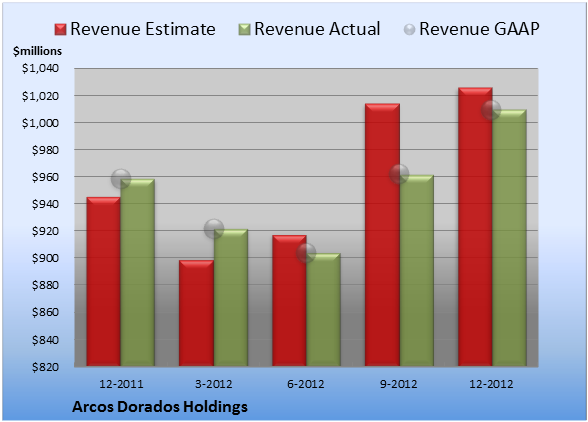 The article Arcos Dorados Holdings Misses on Revenues but Beats on EPS originally appeared on Fool.com. Seth Jayson had no position in any company mentioned here at the time of publication.  You can view his stock holdings here. He is co-advisor ofMotley Fool Hidden Gems, which provides new small-cap ideas every month, backed by a real-money portfolio. 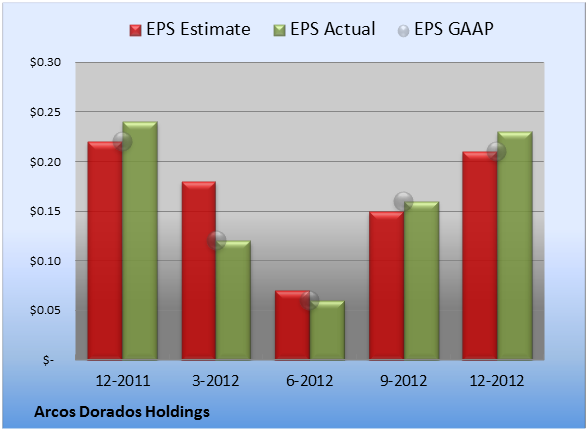 The Motley Fool owns shares of Arcos Dorados.  Try any of our Foolish newsletter services free for 30 days. We Fools may not all hold the same opinions, but we all believe that considering a diverse range of insights makes us better investors. The Motley Fool has a disclosure policy.